Despite the popularity of online dating, it is not uncommon for people to have their reservations and be reluctant to spend any money until they are sure it is right for them. If this sounds like you, then you should consider using a free dating site to get a feel for what it is all about. You might be surprised to learn that there are a number of dating sites around that offer their services for free, and these are a great way to give online dating a go without actually incurring any expense. We have compiled a list of the best free dating sites and ranked them based on a number of important factors. Free dating websites can fall into one of three different categories. There are those that are completely free to use and give you access to all their features without ever charging, while others offer a free basic membership but charge for a full membership. There are also a number of sites that offer a limited period free trial, with the option to become a paid member subsequently. We have looked at several sites in all three of those categories, and then ranked them based on several factors. One of the first things we look at is the number of active members. Many dating sites claim to have a huge membership base, but you sign up only to find that most of the profiles have not been updated for months and there are actually very few people using the site. We would never recommend such sites as it can be incredibly frustrating to spend time browsing through a load of profiles, contacting those that you are interested in and then never getting a response from anyone as they are no longer checking their messages. The free websites that we have listed here all have a healthy number of active members and give you a good chance of making contact with new people. We also take a look at how user-friendly and functional a site is. Some free dating sites are really hard to use with very limited features, and these are usually best avoided. For a site to be listed here it has to be reasonably easy to carry out the basic functions such as signing up, creating a profile, searching through other members and getting in touch with other members. Some of the other factors that we examine are security, privacy and the level of customer service offered. We take all of this into consideration, and then rank the sites according to which ones we feel have the most to offer. There are a couple of major advantages to using free dating sites rather than paid ones, but there are some disadvantages too. The biggest advantage is the obvious one – there is no expense involved. The best free dating sites have many satisfied customers that have found exactly what they are looking for without spending a penny. Even if you don’t have much success, at the very least you can get a feel for what online dating is all about and whether it is right for you before deciding if you want to upgrade to a paid service or not. The other major advantage is that many of these sites have a lot of members and you will find people from all walks of life at them. As the sites don’t cost anything, it is somewhat logical that they will find it easier to attract members and this can result in a large and diverse membership base. In turn, this will mean that you have a decent chance of meeting the kind of person you are looking for. However, this also leads to one of the potential disadvantages of using free dating sites. Because they are free to join, it is more difficult to determine whether or not someone is actually committed to meeting new people. A lot of people do sign up at these sites purely for a bit of fun and are not necessarily that serious. If you are just looking for some fun yourself then this is obviously not an issue, but if you are looking for a long-term relationship then this is a pitfall you need to be aware of. 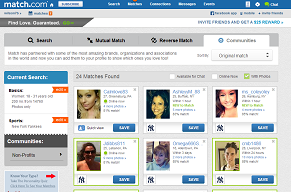 Another disadvantage is the fact that fake profiles are far more common at free dating websites. People set up fake profiles for a number of reasons; they could be spammers, scammers or trying to get free advertising. These don’t necessarily have to be a major problem as they are usually pretty easy to spot, but they can be somewhat annoying. All in all, free dating sites are definitely worth trying out. There are a few downsides, but there is also every chance that you could be successful and you quite literally have nothing to lose. You may find that you eventually decide to upgrade to a paid option but, either way, at least you can give online dating a shot before parting with any cash. When you are ready to use a paid site and take advantage of better features, head over to our homepage for listings and reviews.